Aam Aadmi Party today strongly defended its government's decision to bring back the odd-even road-rationing scheme, saying vehicular pollution was the biggest source of ultrafine particulate matter. File picture of a monstrous traffic jam in New Delhi adding to the air pollution. NEW DELHI: The Aam Aadmi Party today strongly defended its government's decision to bring back the odd-even road-rationing scheme, saying vehicular pollution was the biggest source of ultrafine particulate matters measuring less than 2.5 microns. AAP's Delhi unit convener and Labour Minister Gopal Rai said "creating awareness" was the biggest success of the previous two rounds of the scheme, while alleging there were multiple attempts to "sabotage" its second round, enforced in April last year. Rai was holding the transport portfolio when the previous two rounds were executed in Delhi. His comments come against the backdrop of the National Green Tribunal doubting the efficacy of the scheme. Rai said that dust from construction activities and road dust were major sources of particulates in the city, but they contributed more in the formation of PM10. "PM 2.5, of which vehicular combustion is a major source, is a pollutant that chokes the lungs and leads to other respiratory diseases. PM10 is also another major pollutant but that is the usually the dust on the roads and dust in itself is not harmful. "But heavy vehicular traffic grinds the PM10 to PM 2.5, further aggravating the problem. With the odd-even scheme in place, we hope to bring this down," Rai said. Ruing that multiple agencies are involved in combating air pollution in the city, Rai emphasised on better coordination between the Centre and the state. "There has to be a holistic solution to the problem. The Centre should form a council comprising the states to tackle this menace which has multiple causes," Rai said. 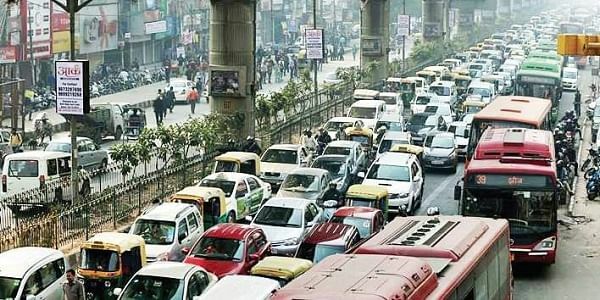 Referring to the Delhi government's decision to make public transport free during the odd-even scheme next week, Rai hinted there could be few more such changes in the run up to the traffic-rationing move. A landmark IIT-Kanpur study, which covered the period 2013-14, said during winters, vehicles are the second largest and the "most consistent" contributing source of pollutants PM10 and PM2.5. In terms of percentage, it comes to around 20-25 per cent during winters, the report says. The contribution of road dust is negligible during the colder months unlike summer when it plays a bigger role, it adds.